Pattaya, a tourist city in Thailand, is famous for the bustling activities at night. However, besides noisy pubs and vibrant dance, tourists can still find stillness when they visit Prasat Sajjatham – “The Sanctuary of Truth”. This temple is not only a perfect version of the ancient architecture art but also a testament to the creativity of modern art in Thailand. 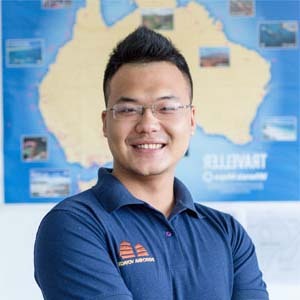 The Sanctuary of The Truth was started on 13/08/1981, comes from the idea of a Thailand billionaire – Mr Lek Viriyaphan and is scheduled to be complete in 2025. The building is about 105 meters high, 100 meters long. 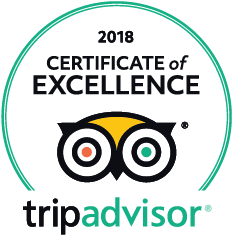 The inside area is 2,115 square meters but the whole covers an area of about 12,8 ha, including dolphin aquarium, orchid garden, crocodile and elephant cotes. 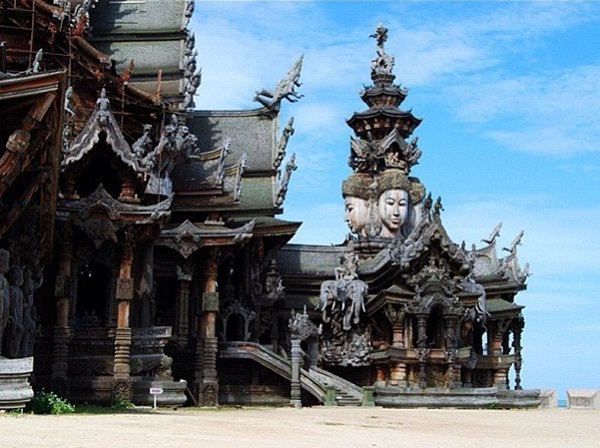 The sanctuary is an all-wood building with sculptures based on traditional Buddhist and Hindu motifs. The Sanctuary of Truth is divided into four different compartments overlooking four sides. One compartment portrays spirit of China. One compartment portrays Hindu mythology. Another one makes us remind the majestic architecture of Angkor Wat. 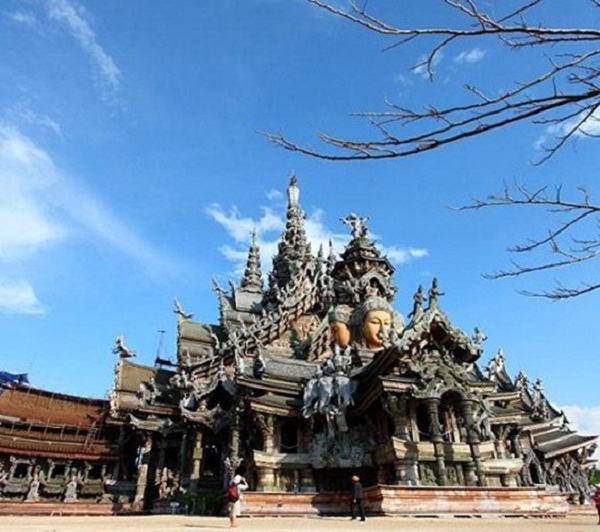 And the main compartment depicts traditional architecture style of Thailand. 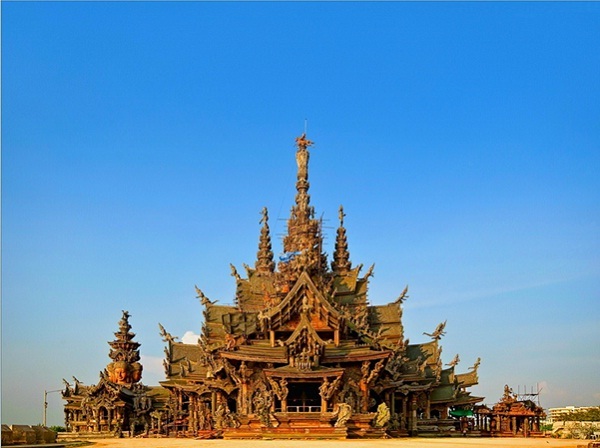 At first glance, it seems that the temple was designed with Thai architecture, but every detail of the temple is influenced by art of four different philosophies in Thailand, Cambodia, China, and India. 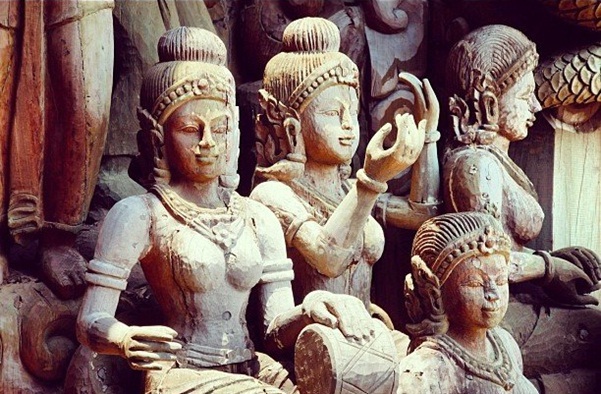 The temple consists of thousands of statues, many of which simulate the mythical characters of Hinduism and Buddhism. Inside the temple, there are many bas-reliefs which reflect the worldview of the East. The Indian epic scenes of the Mahabharata and Ramayana time, the story of the battle between good and evil, between wisdom and ignorance, etc. are resuscitated in the temple. They are portrayed subtly and meticulously. A special in building of this temple is that there is no nail. All the details are put together by wooden pegs. With the artistic vision, The Sanctuary of Truth is a masterpiece of architecture and art. Although the temple has not been completed yet, but they still open for tourists who come to admire. The Sanctuary of Truth is opened daily from 8 am to 5 pm. Ticket fee is 700 baht for adults, 450 baht for children. 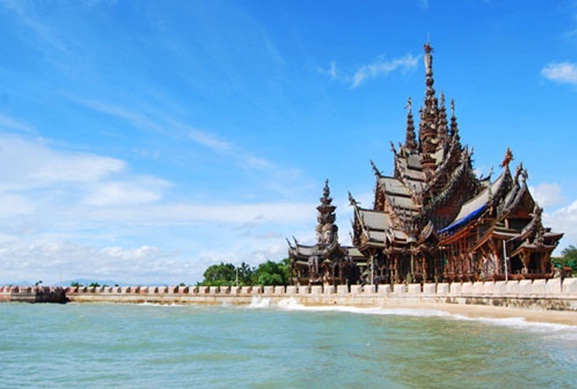 In a peaceful place on the beach, Prasat Sajjatham – “The Sanctuary of Truth” will surely bring you a memorable trip ever. You can freely take pictures, admire the unique architectural style and enjoy moments of relaxation.